Setting up cattle for a long career in your herd begins when they are calves. Every dairy producer wants heifers that are easy to handle, healthy, fertile and productive from the start of the first lactation. Top-quality care from trained employees, along with positive human interactions, will positively impact a calf's future performance as a milk cow. Cattle learn from their interactions with people, and this begins when they are calves. They will remember the training they receive when they are young. As the calves graduate into larger groups, good stockmanship practices will make working with the animals more efficient when they are required to move into new pens, walk on cement and are introduced to headlocks. When practicing good stockmanship, employees might not look like they are working because they are standing or walking calmly, yet they're still paying attention to the cattle. If the animals are calm and moving in the direction that is required, employees are doing their job well. Good calf care requires a commitment from dairy owners and managers to continually train and support employees and develop standard operating procedures (SOPs) for handling and care of youngstock. This training can help prevent animal handling-related accidents, which may lead to lower insurance premiums, fewer workers' compensation claims and increased worker satisfaction. Implementing SOPs and training employees is the right thing to do for your animals, your employees and your operation. As soon as a calf is born, it needs to be closely watched and gently cared for as its mother returns to the milking herd. Protocols for newborn calf care and stockmanship should be developed and followed from day one. The following are examples of management areas that should be addressed. Calves should be born in a clean, dry and well-observed environment. The cow can be allowed to lick the calf for 20 minutes to help dry the calf and stimulate breathing. Next, the calf's navel should be dipped with strong iodine to kill bacteria on the umbilical stump. This can be repeated again on the day of birth as well as the following day. Within 30 minutes of being born, the calf should be moved to a clean, warm nursery and fed its first meal of colostrum. Colostrum must be tested to ensure high levels of antibodies and low levels of bacteria. Large calves, such as Holsteins, need 1 gallon of colostrum that is warmed to 100 to 105 degrees F. Smaller Jersey calves need 2 to 3 quarts of warmed colostrum. The sooner the calf is fed colostrum, the more likely it is to have optimal absorption of antibodies. Once calves are fed and dry, they can be moved from the nursery to their individual hutches. Make sure the transport trailer or wagon is clean and recently bedded. Calves will need to be lifted and placed on the trailer because they are too young to walk on their own. Be careful when moving young calves because their growth plates are not closed and mishandling can easily cause a broken leg or rib. Newborn calves gain all their nutritional calories from milk. It is important to provide enough energy for the young calf to grow and support the immune system. Energy requirements can change with the season, as a calf requires additional energy to warm itself in the winter and cool itself during the extreme heat of summer. When feeding baby calves, consistency is the most important rule to remember. There are several strategies to ensure caloric requirements of the calf are met and you see the results of healthy growing calves. 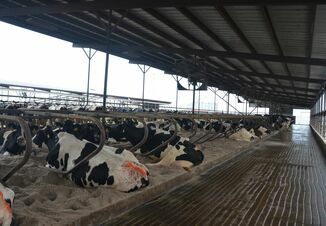 Feeding a higher energy density of milk, feeding a greater volume of milk at each feeding and feeding more times a day. Calves also require access to clean water and starter grain at all times. Feeding milk consistent in total solids, temperature, time and volume. Consistent timing between each feeding is also important. If calves are fed three times per day, for example, then the feedings should be as close to eight hours apart as possible. Health complications such as diarrhea bloat and clostridial disease can occur if the rule of consistency is not followed. Feeding time is an ideal time to vaccinate young calves, as it can usually be done by one person and eliminates the need to enter the hutch with a calf. Calves will be standing, alert and looking for milk. This makes access to the nose and neck easy for administration of intranasal and subcutaneous vaccines. Intranasal vaccination is a great young calf option. The vaccine should be administered through a cannula that is fully inserted into the calf's nose. Vaccines can also be conveniently administered subcutaneously while a calf is feeding or looking for milk. The calf can be restrained from outside of the hutch using a cane or strap to keep the calf from moving backwards. The prescapular area of the neck is the best location for a subcutaneous injection. A needle with a gauge of 16 or 18 and a length of one-half inch will ensure vaccine is placed under the skin and not in the calf's muscle. If vaccination is not performed at feeding, a worker may need to enter the hutch. 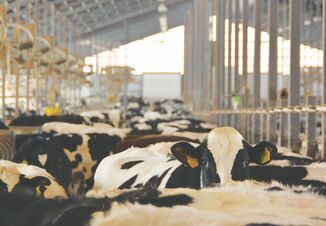 If calves are in a group pen, vaccination may require two people with one person restraining the calf and one person administering the vaccine. 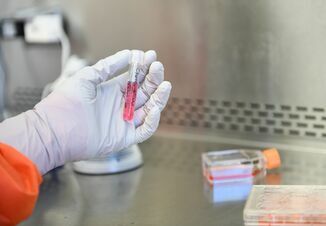 Proper position and restraint is important to ensure the vaccine is administered in the correct location for the calf's immune system to fully respond. If two vaccines are to be given in one day, administer the vaccines on the opposite sides of the neck. Sick calves should not be vaccinated. Simply record that the calf has not been vaccinated and administer vaccine once calf is healthy or has completed treatments. A sick calf needs to be examined and the veterinarian's treatment protocol followed. Always keep records when treating calves, including the animal identification, date of treatment, therapy given and suspect disease diagnosed. Recordkeeping and following your veterinarian's protocols ensures proper treatment of disease, protection against unwanted residues and the receipt of data that can be analyzed later to evaluate vaccination and treatment protocols. When treating a calf, make sure to use the correct size needle for the medicine, size of the calf and route of administration. Subcutaneous injections should use a one-half-inch needle, and intramuscular administration should use a three-fourths-inch or 1-inch needle, depending on the size of the calf. Calf restraint during treatment is also very important to ensure the medication is fully administered into the correct location, as well as for the safety of the worker. Biosecurity is also very important to calf health. Whenever individuals enter the hutch and touch the calf, they contaminate themselves and can spread disease to the next calf. For calf and employee safety, ask employees to enter the hutch only when necessary. Always work calves from youngest to oldest. Train employees to follow this rule when feeding, vaccinating, checking health status and treating sick calves with medicine. Calves are the future of your farm and deserve special attention. To help ensure top-quality care, Merck Animal Health has produced a series of Dairy Care365® animal handling video training modules designed to help dairy producers and veterinarians train employees to provide the best animal care at every stage of life. Two new modules have been developed that focus specifically on youngstock care. The first video module covers care and handling of the newborn calf from birth through the first two weeks of life. The second video module addresses proper management of weaned calves from the hutch to group pens. The Dairy Care365 animal handling training videos feature real on-farm settings to provide a realistic representation of how cattle behave and react to their surroundings. The training series includes: Introduction to Dairy Stockmanship; Moving Cows to the Parlor; Handling Non-Ambulatory Cows; and Euthanasia. The training is offered in English and Spanish, and each video module concludes with a short quiz to gauge employee understanding of the material. A customized certificate is also available at the end of each training module to print and keep as a record of the employee training. Also part of Dairy Care365, the Dairy C.A.R.E. booklet includes customizable templates for developing animal care protocols, policies and standard operating procedures. Contact your local Merck Animal Health representative for more information, visit www.dairycare365.com or email info@DairyCare365.com. Q. Is there a difference between BM-1 and BM-3 brown midrib corn hybrids?